Did you need any more proof that climate alarmism is indeed an environmental religion? Can I get a "Hallelujah" ladies and gentlemen? The Church of England's Church Commissioners have gone green, investing £150 million with former US Vice-President Al Gore's environmentally minded investment firm, Generation Investment Management. On Nov 18 the First Church Estates Commissioner, Andreas Whittam Smith reported that in late September the Commissioners had placed the funds with Gore's boutique management firm which follows an "environmentally sustainable global equities mandate." Funding for the investment came from "cash and Treasury bills", he said, and not from the sale of UK equities as initially planned. 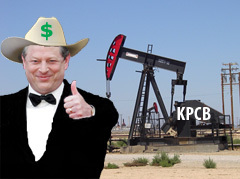 We can only hope for the Church's sake that Gore knows more about investing than he does climatology.